Mike: "I'm writing to see if you'd be interested in receiving a free sample of Ile de France cheese." girlichef: Hmmmmm...why don't you let me think about it for a bit DOES A BEAR SH*T IN THE WOODS!? Okay, I didn't use those exact words. But come on...you know my affection for the fromage! And this I can actually call fromage and it fits 100%. Mike from Ile De France was very mean and made me choose between Brie, Camembert and Goat Cheese. How can I be expected to choose? This is like choosing one of my three beautiful children over the others! But I had to buckle down and make a decision...so I chose one of my favorite cheeses ever...Brie (Brie = The French 'King of Cheese'). Not long after I forced my fingers to type in the name of just one cheese...I received it on my doorstep! I received cheese on my doorstep. What a feelin'! Thanks so much to Mike from Ile De France for generously sending me this lovely wheel of Brie...and to Deb at Kahakai Kitchen for recommending he ask me...you rock!) And by the way...I'm sending this sandwich over to Deb for this week's Souper (soup, salad, sammie) Sundays. Click on the picture to find out more about Souper Sundays! holy cow! seriously....the cow that made that cheese that inspired you to make that sandwich is most def. holy! Does france have holy cows? you are one lucky girl. looks great. Brie is one of my favourite cheeses - maybe my absolute favourite. I don't get it often because of the cost. You are lucky! I also love it schmeared with roasted garlic! that is totaly breelightful and I can feel your joy - in fact that sandwich with a slice of green apple and honey mustard is my all time favorite but arent you supposed to make a cheese platter? You are right, the cheese looks so good & it must have tasted terrific too. The sandwich is so, so tempting! Helllloooooo cheese!!! hehe... I like brie. I like to snack on that with some crackers. I could go for that sandwich right about now though. Yes, I think that would be the perfect midnight snack. 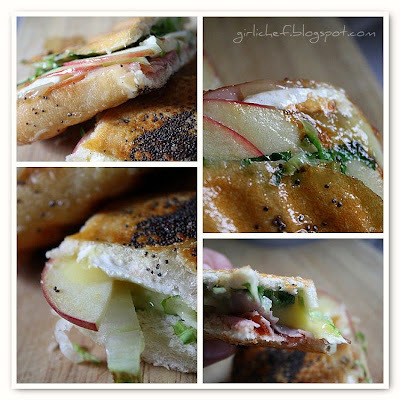 The sandwich looks to die for : ) I love that you got cheese delivered to your doorstep! I wish I could have a cheese delivery like that everyday!! Now, I must have cheese! That sandwich looks amazing! I love brie with sliced chilled apples and grapes. It reminds me of eating with my mom because we're the only ones who like it. That picture of the brie wedge with the apple slice peeking in the corner looks delightful. I mean brie-lightful. Lucky!!!! One of my many favorites... Although I am not familiar with the brand. Does it say on the wheel if it a Double or Triple Cream? OK, I am trying the brie next time for sure. It is hard to pick just one. The sandwich looks incredible! Life could be quite dull without cheese and wine. ye soo lucky to get those yumm cheese!! :) vat great recipe! I'm pretty sure brie is my favorite cheese. If anyone out there would like to send me some, I would be more than happy to review it! HINT HINT. My favorite way to eat it is with some cranberry sauce...best combo ever. 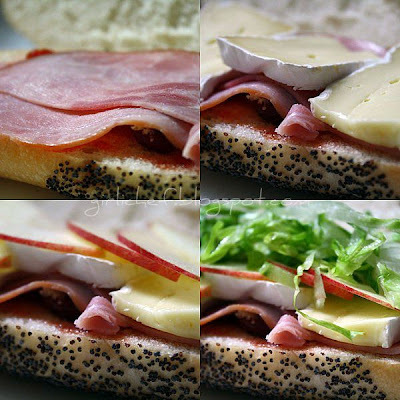 Your sandwich looks delicious, definitely a good use of such a great cheese! What a yummy sandwich!! Sadly my cheese sat outside during the hottest week of the year - until the box was 'accidentally' discovered with the cheese all hot and bubbly inside. Darn that UPS man. just reading your post made my mouth water, not to mention your tantalizing pictures! i've only had brie once, i baked it in a puff pastry and i haven't stopped thinking about it since! I would love some free cheese sent to my house as well! haha AMAZING! When I was younger and I was homesick at camp I would write home saying "I hate this place!!! I MISS BRIEEEEEEE!" haha...my parents came to take me home! Oh wow - is there anything better than hot cheese? Holy cow or sheep or goat! Your pictures have made me hungry. Mike should hope everyone to whom he sent samples did as well by Ill de France as you have with this post. What a beauuuuuuuuuuuuuuuutiful sandwich, I wish I was eating it. Particularly genius, combining hot mustard and sweet jam. I haven't laughed out loud like that in a long time, you are a crack up Heather! I am drooling like Homer Simpson over that sandwich.....GOD. i love that you are now having food and cheese and spices delivered right to your doorstep - now THAT is living! Wow, what a gorgeous sandwich. I've only tried Brie a few times -- usually just baked with crackers -- and this looks over-the-top yummy. Just divine looking! Loving all that suave and sophisticated goodness going on here! OH MY FREAKING GOD! I'll bet you had a sneaky smile as you ate that DELICIOUS brielightful sandwich, knowing in the back of your mind that I would read this post and totally FLIP THE EFF OUT! AHH! So envious! I love brie! Sounds excellent with ham & apple, yum! I was literally drooling while you described the sandwich assembly...oh yeah, and smearing the brie with garlic and jelly and enjoying it with wine and bread. Both scenarios sound just perfect! I was just in N. Indiana this weekend. Had I read this first...I might have stalked you for your brie! That cheese looks monitor-licking good! 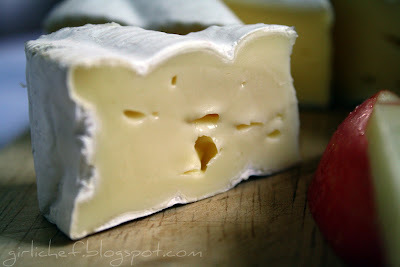 I am a big fan of brie and the soft cheeses. Also cambozola. Best of both worlds. Brie ..... one of the best cheeses in the world. That must have been a fantastic sandwich. I wish I could take a bite of that sandwich! Apples, cheese and ham are always lovely together. How lucky!! I recently discovered my love for brie with cranberry compote, to die for! I like the subtle ones, this sounds awesome. It would be so hard for me to choose between goat cheese and brie! Last meal on earth...please let it be brie, wine and crusty bread!! I LOVE brie! Especially grilled in a sammie. Yum! I am feeling rather deprived. I have never had brei in a sandwich!! I've only ever had it baked in the oven, topped with fruit and served on butter crackers, but I feel a certain hot brei sandwich is in my future. Ahhhhhhhh....you lucky, LUCKY girl! 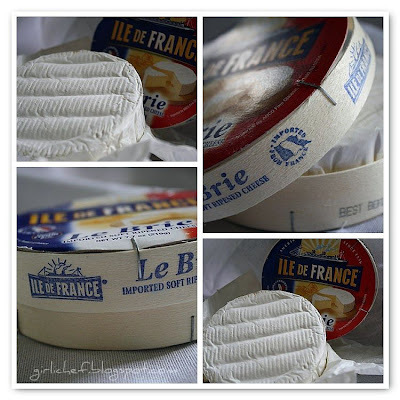 Ile de France is one of our favorites and usually in the cheese drawer in the fridge. Great choice on the Brie. I'm jealous and happy for your good fortune! 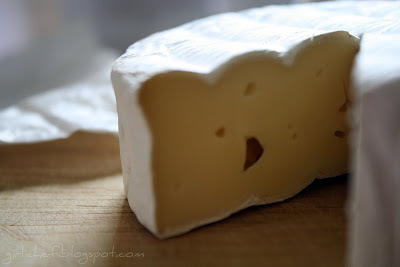 I heart brie too. That sandwich picture is making me drool - it looks SOO good! Brie, one of my favs!! Ah brie...a beautiful thing...and that sandwich...WOW, seriously, a work of art! I would do almost anythuing to have a delicious cheese show up at my doorstep. I love melted brie in a sandwich.